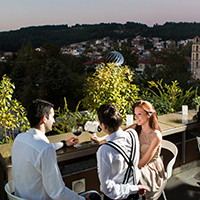 The Café-Bar-Restaurant 'La Vista' is located on the roof garden of PHILIPPOS Xenia Hotel. You can enjoy the unique beauty of the surrounding landscape and a spectacular view of the city of Serres stretching before you. This, combined with the inspired design, results in a feeling of serenity all year round. In the summer outside on the terrace under the stars while during the winter you can warm up near the fire place. Absorb the natural surroundings and the romantic views accompanied by fine wines, cocktails and gourmet dishes. The menus cover a wide range of Mediterranean cuisine and a separate category is dedicated by our specialized chef to Japanese delicacies – sushi, tempura and noodles.